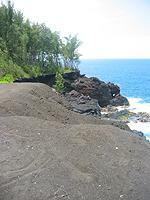 This six mile scenic drive takes you through an isolated road in lower Puna. The road is a nature lovers dream and will transport you back to prehistoric times with huge trees and plants. A number of interesting stops and short hikes along the way offer a chance to stroll or enjoy a picnic lunch. The drive ends at the Cape Kumukahi Lighthouse - the Eastern most point of all the Hawaiian Islands - and offers some of the purest air in the world. This scenic drive is on a mostly dirt road. The road is fine for rental cars and you do not need a 4-wheel drive vehicle. However, we do not recommend this scenic drive in any vehicle if it is raining. There are no bathrooms along this drive and no facilities such as gas, food or drinking water. Bring supplies and make sure you have a full tank of gas. You can find gas in Pāhoa or Kea'au and there is a convenience store near the start of the drive. If you take a short hike or stroll, do not leave valuable items in your car. 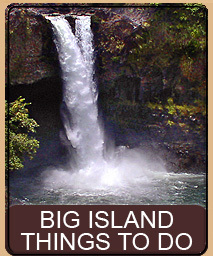 This drive is a nice start to touring lower Puna district and you can easily combine this drive with other drives in the area. To get to the start of the scenic drive take Highway 130 towards the town of Pāhoa. Pass the first intersection that takes you into Pāhoa. Just a bit down the road, after mile marker 10 is another intersection that you can take left. Make a left at that intersection onto Kahakai Road. Follow Kahakai Road about two miles to the curve that goes around Keonepoko School. Follow the curve and continue. Three-tenths of a mile after the curve, on the right hand side is Da Store - your last stop for food and water before the scenic drive. Continue down Kahakai about 3.5 miles past Da Store until you reach the ocean. The houses you see are part of the Hawaiian Shores and Hawaiian Beaches subdivisions. The tall trees are Albesia Trees and the spiky shorter trees are Hala Trees. At the end of Kahakai road, at the ocean, the road makes a right hand curve and takes you between the ocean and houses. Stop the car at the end of the curve, just before it starts heading up a hill. There should be a white house on your right and in front of you, on the hill, a large brown house. Let's begin the scenic drive by turning off your engine and getting out of the car. Just to the left of your car, between you and the ocean - is the first site. Walk over the road and step over the rocks and you will see, just beyond, a sea arch or blowhole. Actually, the hole in the ground is neither a sea arch nor blowhole (it doesn't spray water) - but was formed by a lava tube collapsing. The hole is quite large and opens to the ocean allowing the waves to surge into the hole. We do not advise you to stand on the arch itself. The hole is rapidly disintegrating and the arch is particularly unstable. This feature will probably not be here much longer. Ok, time to start driving. Get back in the car, start it up, and continue around the curve. At the first intersection (and stop sign) make a left. You are now on Papio Street. This is the start of the drive and Papio Street turns into Old Government Road. As you drive the houses will begin to thin out and will be replaced by Casuarina Trees which resemble (but are not) pines and Native Hala Trees. When your odometer reads 0.3 of a mile you will be at Honolulu Landing. There are a number of places to pull off the road here and the view of the ocean is spectacular. This is an excellent place to have a snack or picnic. Honolulu Landing used to be a Hawaiian village - some evidence of which is still visible if you look among the coconut trees across the road. The village was an important canoe landing and trading village. Honolulu Landing was abandoned as a village in 1924 due to earthquakes that caused the shoreline to sink below sea level taking with it a black sand beach. Part of the beach can still be seen if you walk a bit up the road towards the stone structure at 0.5 mile point. Across from the black sand beach are the remains of a stone building. This building was not part of the Honolulu Landing village, but instead was storage shed built in the 1920s. Even though this spot has a black sand beach you should not enter the water here because it is an extremely dangerous spot with fast currents and heavy surf. When you're ready to go continue straight on Government Road. The road is actually called many names. The Old Government Beach Road used to end at Honolulu Landing and a foot trail went forward from there. The trail is known as Puna Trail and went from the very base of Puna all the way up to the mountains. 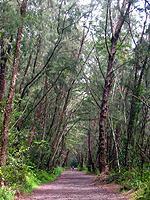 Some maps refer to the road as Puna Trail and others as Old Government Beach Road. Some locals also refer to the road as Wa'a'Wa'a because of the Hawaiian land division by that name in the area. At the 1.0 mile point on your odometer you will see a dirt 2-track that leads to the left with some large rocks and cement nearby. This is the first of two entrances to Sand Hill and Nānāwale Park - the second entrance being 1/10 mile further up. Neither the first nor second entrance should be attempted in a rental car - though the second entrance is the better of the two. If you look back towards the ocean, you will see a very large sand hill composed of black sand. These hills were formed in an 1840 eruption on the east rift zone extending form Kilauea into this area. This is the same eruption that was responsible for forming the beach that used to be at Honolulu Landing. 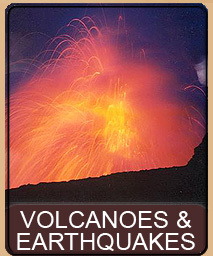 The eruption was huge and over 10 square miles of forest were destroyed. 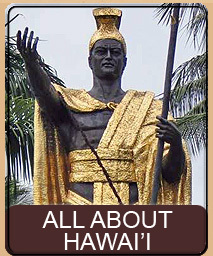 On June 3, 1840 lava entered the ocean by Honolulu Landing. As the flow extended the coast outward 1,300 feet it created three littoral cones. As 2000°F lava entered the ocean much of was instantly turned into super heated steam resulting in huge explosions that sent small pieces of lava into the air. The lava fell creating the three sand cones now called Sand Hills. The hills were originally about 150 feet high but have eroded over time and are smaller today. The sand in the hills is composed of balsite with green peridot (olivine) crystals in it. 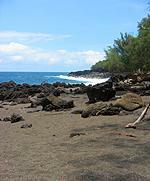 Looking carefully at the sand and you will see glistening green olivine in with the lava. The Nānāwale Park comprises the three littoral cones. There is a picnic table, but no restrooms or water - but camping is allowed. This area is popular with locals on the weekend and portions have been turned into motorcycle tracks. There is also often a significant amount of junk and trashed cars in the area, which periodically get cleaned up. The Sand Hills are so prominent from the ocean that they are used as navigational aids by ships and boats passing through the area. As we continue driving down the road at about the 1.5 mile point the Casuarina Trees give way to Native Hala Trees and the vegetation thins out a bit. This area, as well as parts further down the road have houses and are part of the Wa'a'Wa'a subdivision. There is no power or water servicing the area so all of these houses live off the grid and either have no power, or utilize generators, solar and wind. Water is obtained by catchment tanks, which gather rain from the roofs into large holding tanks (this is how water is obtained for much of the island). This is an eccentric area with diverse people. From hippies to the wealthy, all live here to enjoy the isolation and scenic view the area provides. 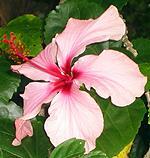 Most of the houses are off the road and barely visible and some have nice yards with flowering Hibiscus. People you meet on the road are generally very friendly and will wave as they pull off to let you by. At odometer 2.3 we once again enter the huge forest - this is where we start to get prehistoric growth. Exactly at the 2.3 mark if you look up into the crooks of the tall trees you will see Bird's Nest Ferns - an indigenous fern used by the Hawaiians to create woven mats. The ferns are spectacular and as you drive along for the next couple of miles you will see countless Bird's Nest Fern ('Ēkaha in Hawaiian). This is one of the best spots on the island to view this plant. All the plants and trees in this area are huge. Vines climb up the tallest of trees and have huge leaves. A variety of alien and native species exist in the under story. Besides the Bird's Nest Fern you will see quite a few other plants trying to eek a living just about anywhere they can sprout up, including right out of the sides and nooks of trees. At the 2.5 odometer point you will see a sign posted on a tree on the right side of the road. The sign is titled Na Kapuna which translates to The Elders. 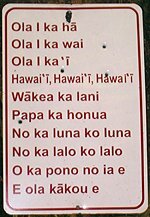 Starting at the sign, and for the next 9/10th of a mile the surrounding land is protected by the Na Kapuna `O Hawai`i Nei organization (translates as We Care For and Protect the Kupuna). 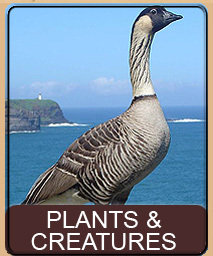 This organization identifies and protects native Hawaiian burial and artifact sites. Throughout this section of road you will see the Kapu - Hawaiian Burial Sites Protected By Law signs. Federal law protects Burial sites. Trespassing and defacement of sites can be met with fines and jail time. Please respect this area as you drive through and enjoy the beauty. Just before the Na Kupuna sign is a driveway on the left - which when I last drove past had a For Sale sign on it. Roughly 0.3 miles down the property, at the ocean is a 250-foot swimming area protected from the ocean by a natural lava rim. The pool is safe for swimming and the water in it is provided by splashes from the ocean surf. At about the 2.8 odometer reading you will see another sign and a road to the left, which is gated. The sign reads Kahuwai and is a cultural and educational project run by Kamehameha Schools. The Kamehameha schools are specifically for Hawaiian children and provide excellent resources, both educational and traditional. Besides promoting Hawaiian language throughout the school system the schools run projects like this, which expose students to native land, plants, historical sites and traditional activities. 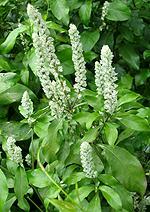 As you continue through this area you will see spectacular plant growth. At the 3.0 mark there are many more huge vine covered trees, with very many Bird's Nest Ferns. As you leave the protected Na Kupuna area at 3.3 miles, you can see an incredible rock wall both on your left and right. You have to look hard because the wall is covered in plants. The wall is about 3 feet high and a foot thick and is tightly packed with lava rocks in the traditional Hawaiian fashion. The wall runs for quite a distance before opening up again with more properties and houses. 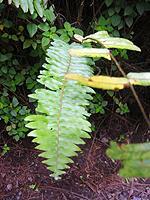 Your last Birds Nest tree fern is about 4.1 miles on the odometer. A little bit past the last Birds Nest Fern the tree line gives way to lava quarries on both sides of the road. These quarries mined lava cinder for use in roads and landscaping from cinder cones. You will curve around the quarries and at 5.3 miles come to an intersection with a stop. This is the end of Government Beach Road. If you turn right at the intersection you are on Highway 132 that takes you back up to Pāhoa. On the other hand, if you go straight at the intersection you will be taking the Red Road Scenic Drive - which will eventually also take you back to Pāhoa. However, we are not going to do either of those. Instead, we are going to turn left - there is a bit more to see on this Scenic Drive. Now that you have turned left you will find yourself on a dirt road once again. This road goes straight - and dead ends - at Cape Kumukahi Lighthouse and also the Eastern most part of all the Hawaiian Islands. About a quarter mile down the road you will spot a road going left that ends in a gate. This is the road to the Kapoho Japanese and Hawaiian cemetery, and is historic. All the a'a lava you see around you is from an eruption in early 1960 that completely wiped out the town of Kapoho. No lives were lost, but the entire main town was eventually destroyed by lava. Attempts were made at creating dams to stop the lava but the eruption continued to take more and more land. It stopped after taking a portion of the Kapoho cemetery. The cemetery walk is very short, only about 1/4 mile. 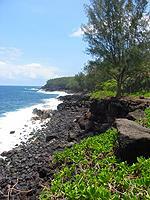 It is historically interesting because parts of the graves are under the lava flow. You can see these as they are marked with an urn or marker over where the family believes the grave to be. This is a quaint and quiet cemetery. If you wish to take the hike simply drive to the gate, park and follow the road. 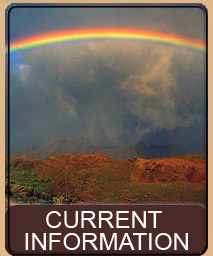 Click here to read the full Kapoho Cemetery Hike. To continue to the lighthouse, just return to the dirt road and keep on going. The road dead-ends into the lighthouse. This point is interesting for a number of reasons. 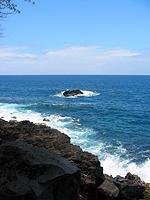 First, it is the eastern most point in the Hawaiian islands. There is nothing between you and California except 2,500 miles of open ocean. This site at Cape Kumukahi has some of the cleanest air in the Northern Hemisphere under typical trade wind conditions. This air from over the Central Pacific contains trace amounts of gases and particles that originated from pollution on other continents. By monitoring the variability in these amounts we can estimate the influence of human activity upon global pollution and the air quality of the Hawaiian Islands. Similar measurements in the upper atmosphere at the top of Mauna Loa (NOAA) provide one of the world's most important data sets on CO2 and the link to human activity, fossil fuel combustion and global warming. 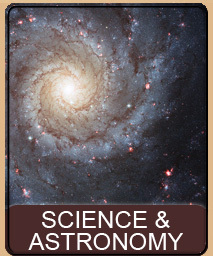 This site at Kumukahi will provide similar data for the atmosphere near the ocean surface. So breath deeply - this is some of the cleanest air around! The second reason this area is interesting is that you can see, if you walk around the lighthouse, how the lava ran up to and just onto the concrete pads that the lighthouse is constructed on. The lava stopped just short of consuming the lighthouse - though nearby buildings just a few feet away were destroyed. To return home, follow the lighthouse road back out the way you came. At the stop sign and intersection you can go straight and you will be on Highway 132. 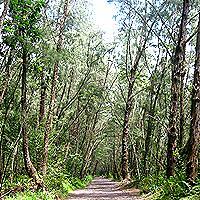 Follow it, past Lava Tree State Park (a quick and enjoyable hike) and back to Pāhoa. At the light in Pāhoa make a right and you will be on Highway 130 back towards Kea'au, Hilo and Kona. This page is named 'Drives.wawa'. Can't Find It?